Back pain is very common in pregnancy. Between a half and three quarters of pregnant women have it at some stage. Pregnancy produces a huge postural change that a woman’s body will ever experience. As the baby grows in the womb and extra weight is increased, the centre of gravity changes resulting in postural changes from week to week. This may cause a diverse range of aches and pain in the body. Your bones and joints are attached by ligaments. Throughout pregnancy, the hormone relaxin loosens your ligaments which allows the baby to pass through your pelvis which puts more strain on muscles and tendons making them ache. This happens from early on in the pregnancy, as relaxin levels increase in the first trimester. As you go through the second and third trimester, the weight of the baby increases and expands your uterus which puts further strains on your muscles and ligaments which can cause you aches and pains. As your abdominal muscles become stretched they can’t assist you to hold your back straight as firmly as before which causes your lower back to take more strain and therefore cause lower back pain. 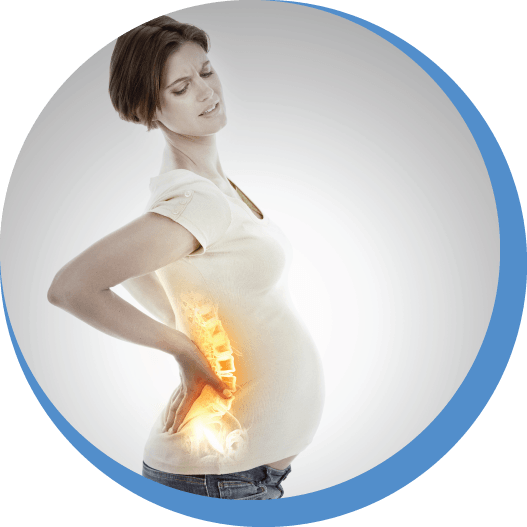 How can Osteopathy help Pregnancy related back pain? Osteopathy can help to provide relief from numerous pregnancy related aches and pains, Osteopathy can help alleviate pain by loosening muscles and joints around the lower back and pelvis by using gentle osteopathic techniques and soft tissue massage and advise on appropriate posture and positions antenatally and for the birth. This will assist the baby into a good position to help better the chances of a straight forward birth. Our aim is to help to improve your quality of life, letting you enjoy your pregnancy. The safety of mother and baby is our main concern, and osteopaths are highly trained and educated to treat antenatal issues. Osteopathy is completely safe at all stages of pregnancy. A post-natal check after your baby is born can also help you to recover from the birth with osteopathic treatment designed to gently ease and loosen sore and tired muscles, increasing joint range of movement and re-balancing the pelvis. It can also help to relieve back pain from breast feeding and lifting your baby.